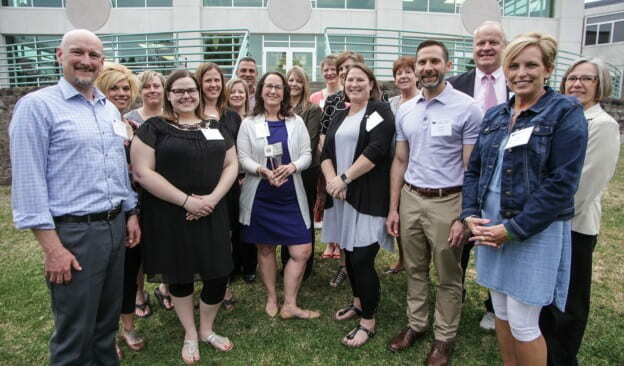 UW-Green Bay and the Plymouth School District marked a milestone in May 2018 — a unique, mutually beneficial relationship that has supported educators for nearly a decade. At a time when many teachers reach into their own pockets for materials to enhance the learning for their students, and districts are looking to stretch or trim operating budgets, the Plymouth Joint School District continues to promote and fully fund tuition and textbooks for its teachers who participate in UW-Green Bay’s master’s program for Applied Leadership in Teaching and Learning. “We believe strongly in collaboration,” said Dan Mella, assistant superintendent for the district. “This arrangement allows us to bring the rigor of a master’s-level program to our campus and tailor it to the needs of our educators.” Open to pre-K to grade 12 teachers, registration is limited to a cohort of 20 students with six-hour classes on Saturdays, over a two-year period. “The educators meet the credit-hour requirements of the University’s graduate program; and we’re able to deliver it in a convenient and collaborative way,” Mella says. That collaborative attitude carries into the structure of the classroom itself, where classes are co-taught by faculty from UW-Green Bay and Plymouth. “The most valuable thing to me was working with fellow Plymouth instructors to create something that was valuable to my own teaching as well as to our district,” said Beau Biller, technology education instructor. He was one of three teammates to research and develop a new technology-focused math course aimed at students not headed for four-year universities. Language Arts teachers Sarah Paff and Keely Mey, have had similar experiences with the program. See photos of the UW-Green Bay and Plymouth School District 10-year partnership celebration. This story by Jim Streed ‘05 originally appear in the Spring/Summer issue of Inside Magazine. This entry was posted in Leading & Learning and tagged CHESW, Education program on September 21, 2018 by Kimberly Vlies.